If everything is unreal or illusion in the western sense of the word then there is no reason to care about anything and anyone. The 'illusion' in eastern sense of the word has a meaning which only the Self-realized can understand and no one else! There is no description or example which to illustrate this! Separation and unification are mind categories. The Ultimate Truth is above all that. Krishna, it is so strange. Some of Your followers who accept Your Maya as illusion behave like Maya is the most imortant thing and some of Your devotees who accept Your Energy as real behave like It is not. How strange is Your Divine Lila, o, Lord. O, Sri Rama, when Your devotees see Your face and hear Your Name they lose interest in all else. Even in their dream Your Form embraces their being. How can this be explained? It cannot! That's why You are called Vishnu - the all-pervading and very few realize this mystery. You are the changeless substance of everything. All Names, Forms, Gods, living beings, worlds and energies are contained in Your Name. 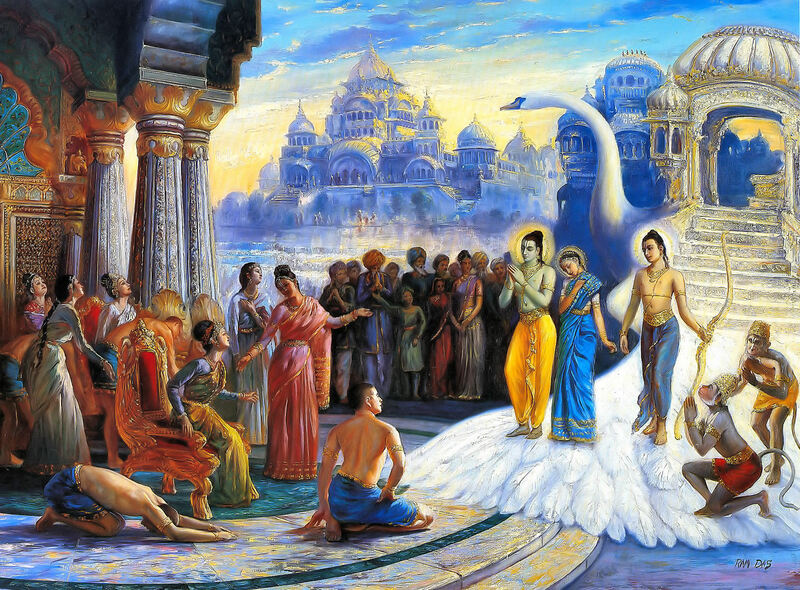 The Name of Rama is the ultimate remedy and the best way to cross the lake of samsara. Nobody knows the true significance of Your Name, Lord, but Your devotees take refuge in It and by Your infinite Mercy they are saved. This is more than enough. The thirsty man takes as much water as it is needed to quench the thirst. If we wash away all that we were taught, all that we have read and ask ourselves what we really want we will be surprised. We don't want some absolute reality called by hundreds of names devoid of any individuality. The proof for that is that majority of the people believe in eternal heaven. What we really want is just happiness, existence, love, acceptance. We want to live forever with the most dear relatives and friends. This is seen in life even now. Everyone cares so much more about his/her child, mother, father, brother, sister, friend, husband, wife than anything else and tries to protect them at all costs. This inherent will to live forever with our dearest is the main reason a very few people to really, by heart, accept the non-dual philosophy. Everyone should choose for him/herself what to listen - the heart which loves the people and consider them as real as possible or the mind who argues all is illusion and must be rejected as objective reality and to trust the words of men who say they have experienced something which is above the ordinary. - Who am I, o, venerable Sage? - It all depends on the view point. For your mother and father, you are their beloved son; for the dealer you are just another source of money; for the lion you are tasty meat; for the young girls you are beautiful young man, for the other young men you are competition; for the ants you are enemy; for your dog you are his/hers best friend; for the nothingness you are nothing; for yourself you are the most precious person; for your wife you are the beloved husband; for the earth-worms you are future meal; for the parasites you are home and source of food; for your business partner you are cooperator; for the universe you are insignifican particle, for the most people you are ordinary person; for Yama you are one of His preys; for Brahma you are one of His magnificent creations; for me, my dear boy, you are my own Self. If one truly believes that everything is illusion and the individual self is non-existent then all other questions and queries are meaningless, bordering on insanity. But if he/she does not believe so then what is the point and what is the value of such teachings? Advaita is like "If I must chose between me and others I would chose none". This is really bizarre for the ordinary mind. God is the only winner now and forever. "It is not the healthy who need a doctor, but the sick. I have not come to call the righteous, but sinners to repentance." The only thing I am sure is that I am not sure about anything. Whatever we now consider as knowledge is actually a certain degree of faith. Merry Christmas to all! Today the Incarnation of Love has been born in a stable. Born as poor child He became the Prince of Peace and Compassion. He captured the heart of almost half of the world. Let today we remember His glorious and profound teachings and deeply meditate on them. "What you seek after (is) within you."